Herba Buena is cultivated throughout the Philippines, although it does well at higher altitudes. It is grown on Mt. Banahaw. 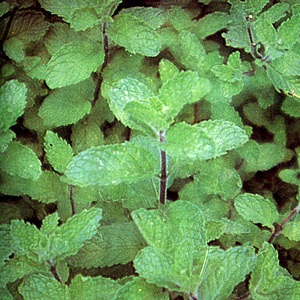 This mint is known as a remedy for weakness of the stomach and for diarrhea. It is valuable as an antiseptic, and has been used in alcohol solutions for asthma. Branched, strongly aromatic herb that stems up to 40 cm long with ascending terminal branches. Leaves are elliptic to oblong-ovate, 1.5 to 2 cms long, short-petioled, toothed margins, rounded or blunt tipped. Hairy purplish to light blue axillary flowers. One of the oldest household remedies known. Crushed or bruised leaves for insect bites. Decoction and infusion of leaves and stems used for fever, stomach aches, dysmenorrhea, and diuresis. Pounded leaves for insect bites, fevers, toothaches, headaches. For dizziness: Crushed fresh plants or leaves are sniffed. Powdered dried plant as dentrifice. Headaches: Crushed leaves are applied on the forehead and temples. Toothaches: (1) Wet a small piece of cotten with juice expressed from crushed leaves; apply this impregnated cotton bud to the tooth. (2) Boil 6 tbsp. of leaves in two glasses of water for 15 minutes; strain and cool. Divide the decoction into 2 parts and take every 3 to 4 hours. Flatulence: Boil 4 tbsp of chopped leaves in 1 cup water for five minutes; strain. Drink the decoction while lukewarm. Facilitates expulsion of flatus. Cough: Boil 6 tbsp of chopped leaves in 2 glasses of water for 15 mins; cool and strain. Divide the decoctioninto three parts; take 1 part 3 times a day. Arthritis: Warm fresh leaves over low flame; then pound. Apply pounded leaves while warm on the painful joints or muscles. This entry was posted in List of Medicinal Plants in the Philippines and tagged herba buena on March 16, 2009 by Pinoy Herbs. thanks a lot for this!! really appreciate it!! tnx.. helps me a lot on my research…i will visit ur website more often..